What was life like for women in the workforce over the past 150 years? To help answer that question, I turned to the museum’s incredible costume collection. The collection includes clothing of all kinds, not just theatrical costumes. Each garment tells a story about what the women’s daily lives were like: the expectations they faced, the obstacles they encountered, and the difference they made. 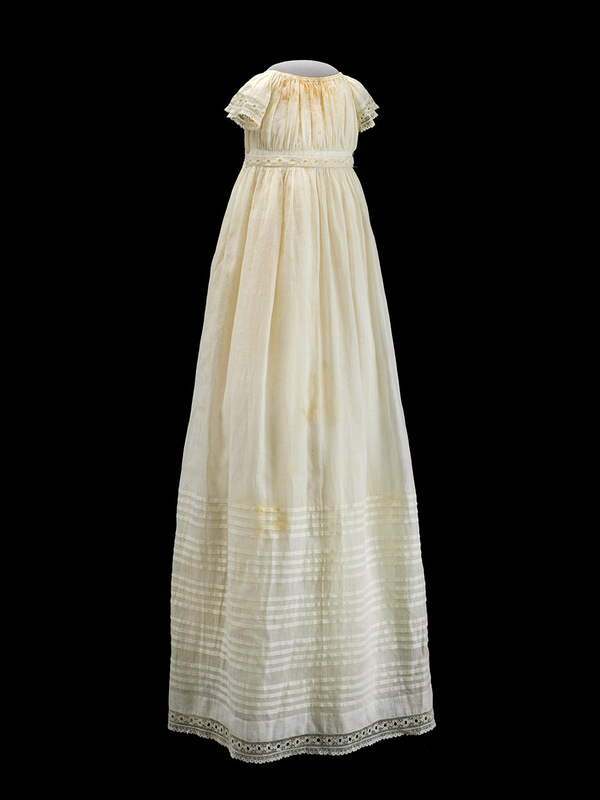 A christening gown Elizabeth Keckley made for her goddaughter. This object weaves together the history of the Civil War, philanthropy, and business through the story of entrepreneur Elizabeth Keckley, best known as Mary Lincoln’s dressmaker. Keckley made this dress for her own goddaughter. Born into slavery, she used her skills as a seamstress to earn money, which she used to purchase not only her freedom, but also that of her sons. Moving north, she continued her work as a seamstress—using her position and her earnings to support her community. She hired and trained African American women to work in her shop. 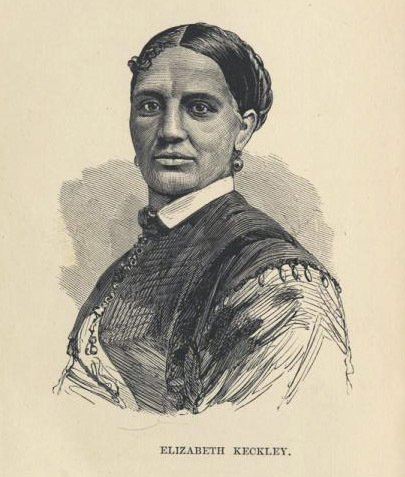 An illustration of Elizabeth Keckley from her memoir “Behind the Scenes, or, Thirty Years a Slave, and Four Years in the White House." 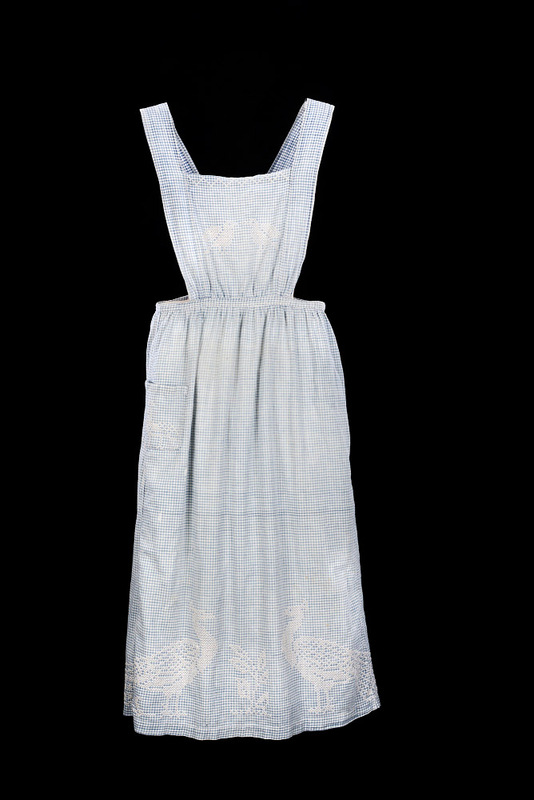 A shirtwaist like the ones made and worn by the women working in the garment industry in the early 1900s. Shirtwaists like this were popular in the early part of the 1900s. 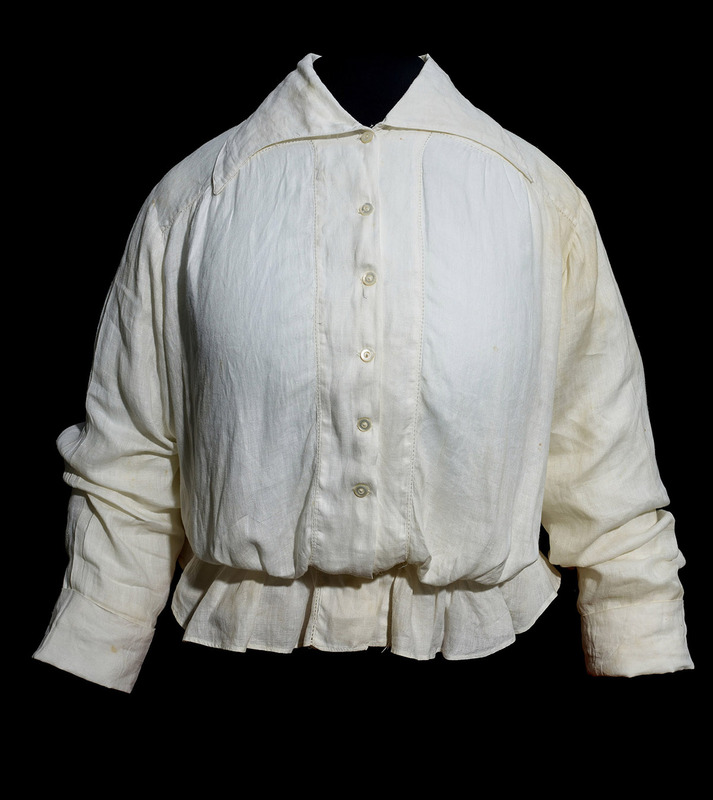 This type of garment was considered appropriate for women entering the workforce and provided jobs, as thousands of women went to work in garment factories producing shirts like these. Strikers during the Uprising of the 20,000. Courtesy of Library of Congress, George Grantham Bain Collection. Pushing back against the poor conditions, women (and men) at garment factories fought for their rights through unions and strikes. 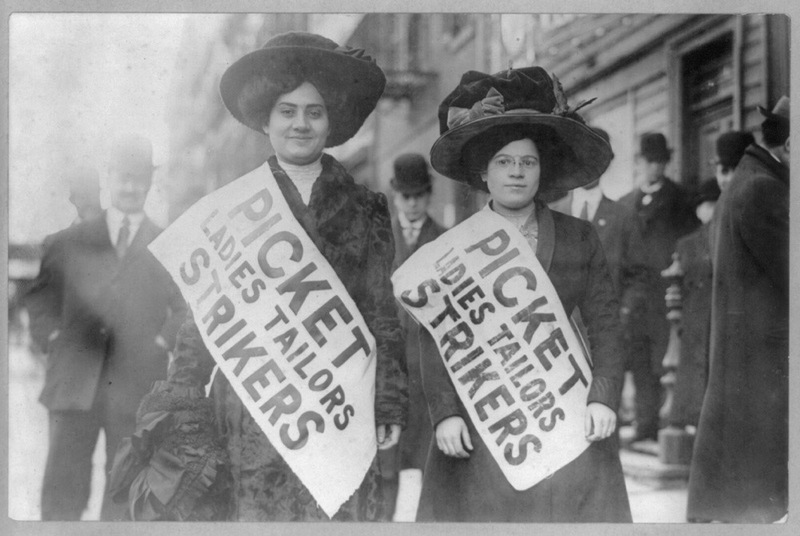 In 1909 garment workers in New York City went on strike. What started as individual strikes at different garment factories quickly grew into a citywide movement: the Uprising of the 20,000. According to some sources, it remains one of the largest strike by women in American history. Through the 11-week strike, workers at most firms were able to negotiate a 52-hour workweek, at least four paid holidays, provisions for tools and materials, and more. However, these improvements didn’t eliminate the dangerous conditions. The plight of garment workers also captured public attention and interest. Upper-class people—especially women—raised awareness about the unsafe conditions in many garment factories and advocated for better treatment. 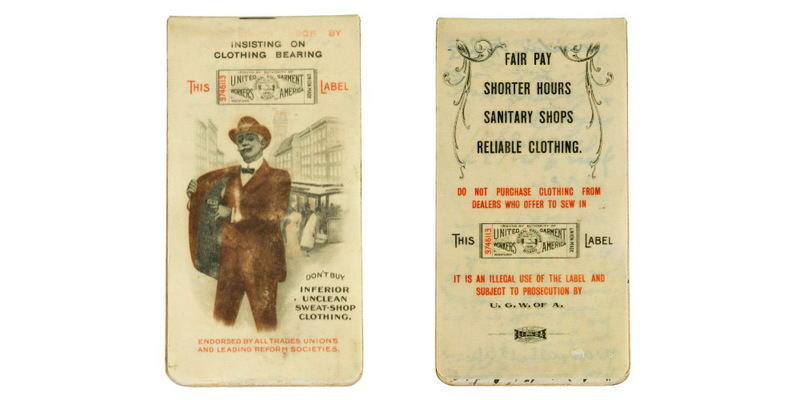 Florence Kelley, a woman of means, started a “white label” program to literally tag products made under fair working conditions. 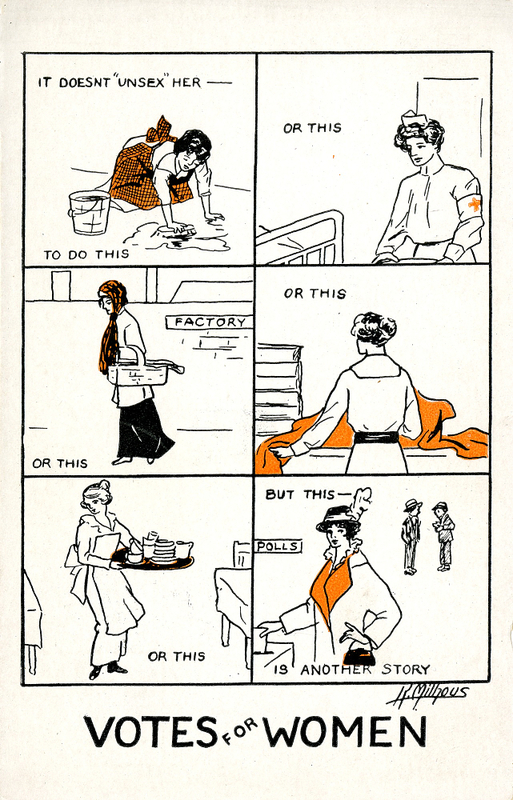 An advertisement for the “white label” program encouraging consumers to only purchase clothing with the label, as it stood for fair pay, shorter hours, sanitary shops, and reliable clothing. Ultimately, however, tragedy would capture the most attention. Devastating fires like the one that ripped through the Triangle Shirtwaist Factory captured public attention and helped usher in labor safety legislation. 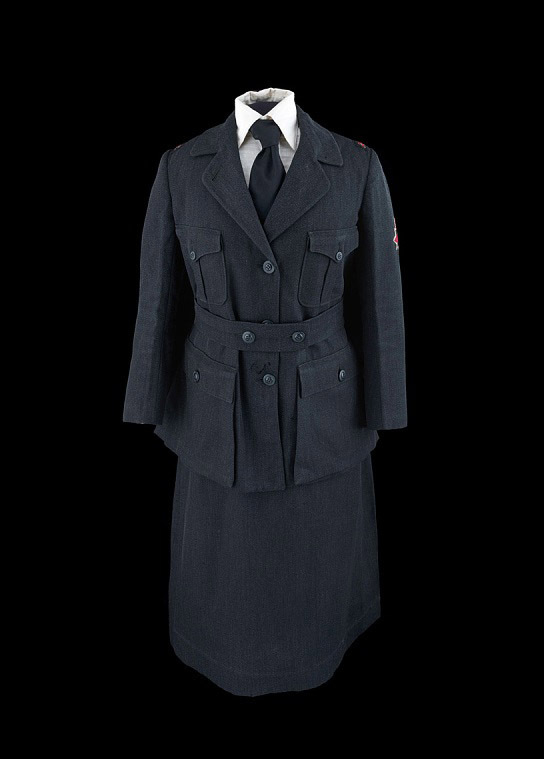 Mabel C. S. D’Olier’s uniform as a member of the American Friends Service Committee. Often the museum only displays textile objects for a short amount of time, these garments may not be on display when you visit. Gift of Mabel C. S. D’Olier through The National Society of the Colonial Dames of America. During World War I, women put on uniforms as volunteers with private social service and religious organizations. Volunteering at home and abroad, with organizations such as the American Red Cross, the National Catholic War Council, the Jewish Welfare Board, and the National League for Women’s Service, as well as countless other organizations, women did what they could to help both soldiers and civilians during the war. For some women, volunteering demonstrated that they were full citizens . . . and as such deserved the right to vote. This postcard, part of the National American Woman Suffrage Campaign, addressed the anti-suffrage argument that entering the masculine world of politics would take away from a woman’s femininity. Citing difficult tasks including wartime volunteerism, the postcard asks if those things don’t “unsex” a woman, why would voting. Gift of Edna L. Stantial. This poster from the National Woman Suffrage Publishing Company advocated for a women’s right to vote. 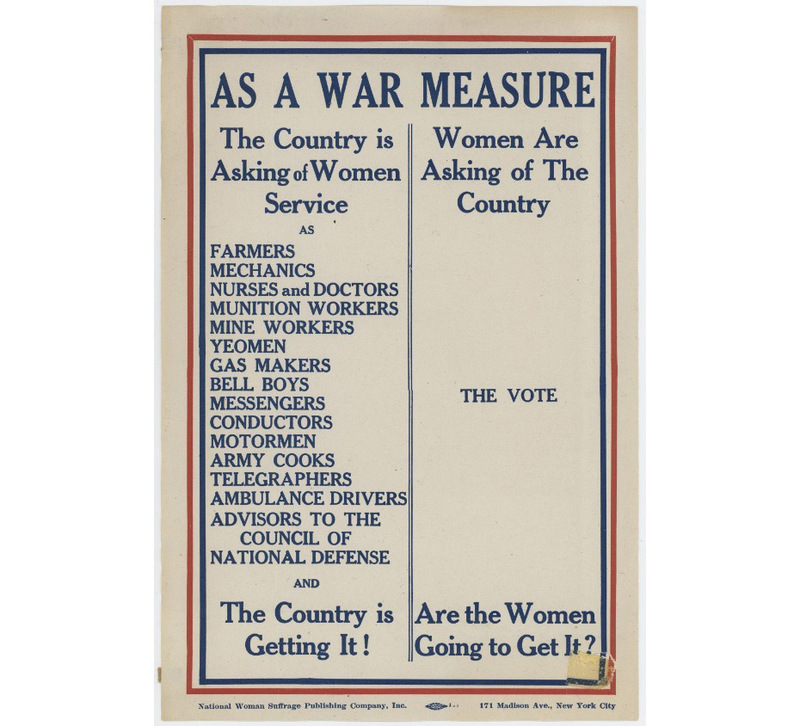 National American Woman Suffrage Association broadside, around 1918, Women’s Suffrage Ephemera Collection, Special Collections Department, Bryn Mawr College Library. Concha Sanchez, her daughter Maria, and her granddaughter Irene, around 1940. Courtesy of Anna Rios Bermudez. Concepción “Concha” Sanchez pulled this apron over her head when she went to work supporting her family. 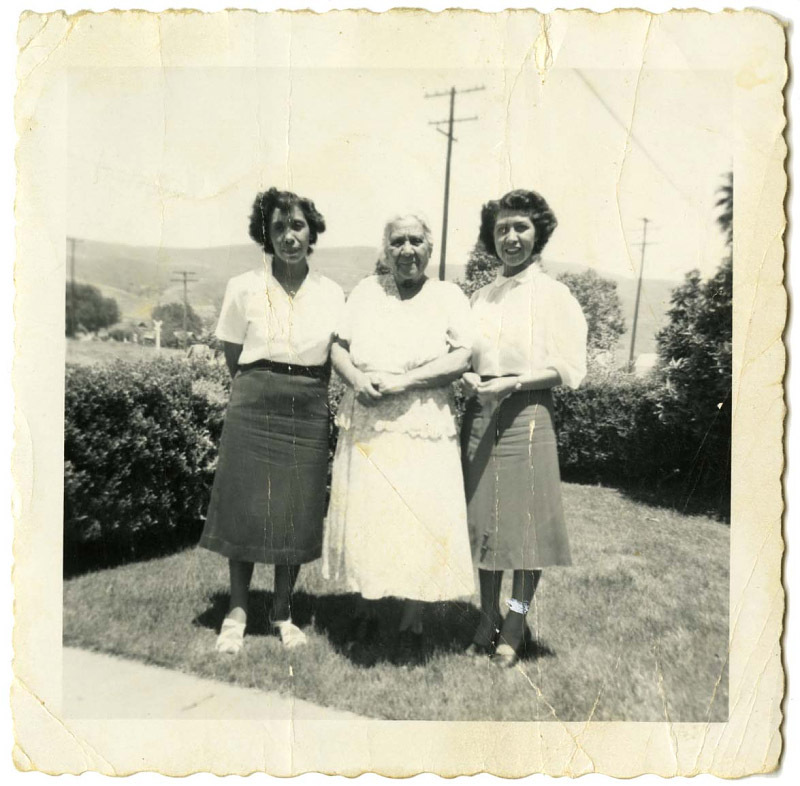 The Sanchez family migrated to the United States from Mexico in 1912. The family worked to support themselves in a variety of ways, first as railroad track workers, then by working in produce fields, then by opening a grocery store. However, during the Great Depression, the grocery store failed and the Sanchez family looked for another source of income: tortillas. Sanchez sold tortillas in her neighborhood in Ventura County, California. Sanchez was in her 80s when she stopped. 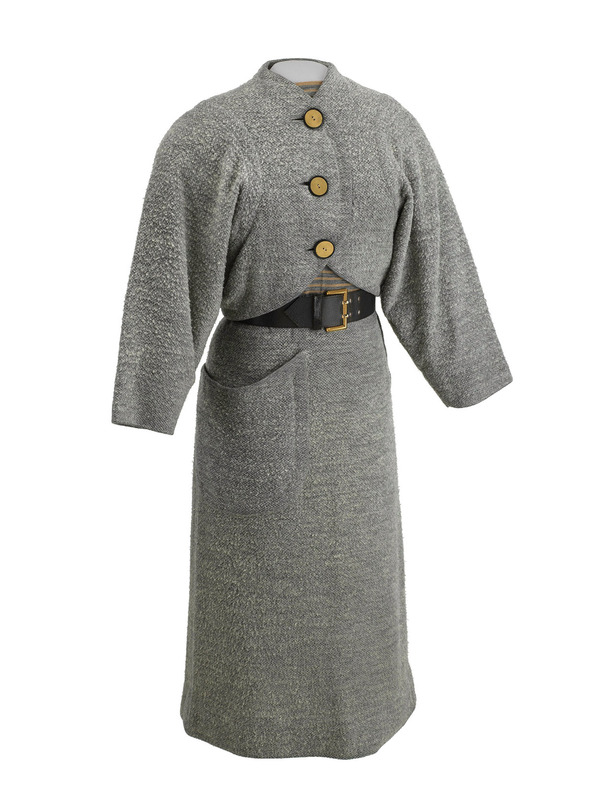 A gray suit like this one, designed by Claire McCardell, was meant to blend femininity with functionality for the 1950s American woman at work. The growing presence of women in the workforce in the 1940s and 1950s meant big changes. Both men and women grappled with what it meant to have a coed workplace. Women learned to navigate the often male-dominated workplace, balancing expectations, their ambitions, and at times their own safety. Suits like this one were meant to mirror a man’s suit, with feminine styling and flexibility for comfort and practicality during the workday. 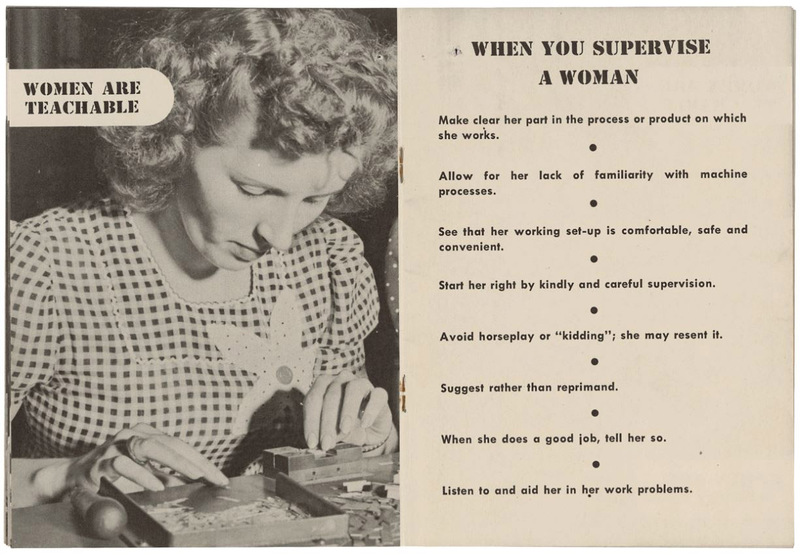 An excerpt from the Radio Corporation of America’s (RCA) guide for male supervisors of women. Courtesy of National Archives, Records of the War Manpower Commission, 1936–1951. The cover of “Charm” magazine’s inaugural issue, published in August 1950. 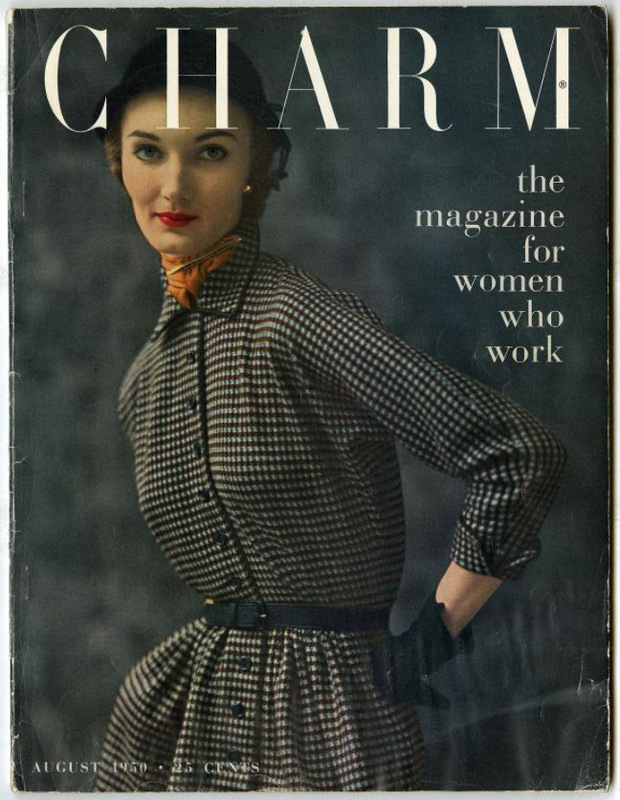 Charm marketed itself as “the magazine for women who work.” Courtesy of Archives Center, Estelle Ellis Collection. Women in the workforce signaled changes outside the office too. “Any way you look at it women who work need more . . . buy more . . . use more,” explained Charm magazine—one of the many products and publications that emerged to cater to working women. 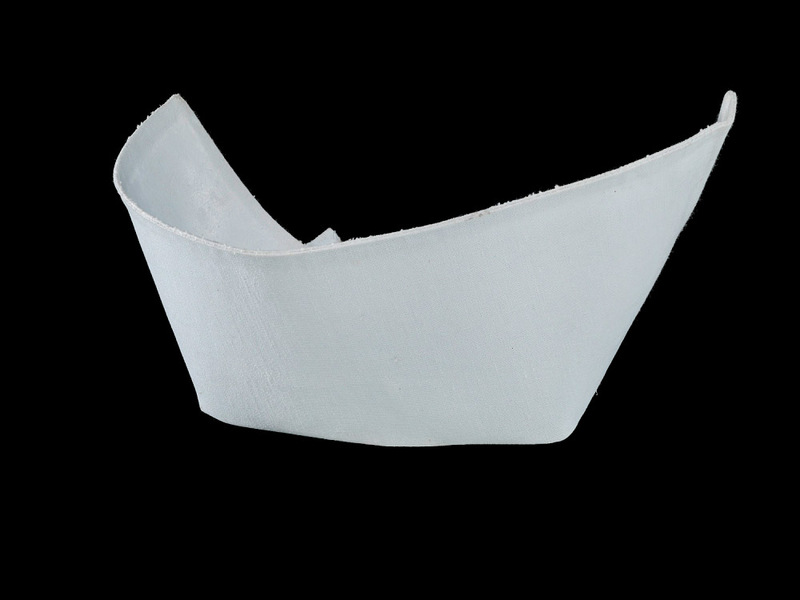 Maria Jayme received this nursing cap when she graduated with her nursing degree in 1991. This nurse’s cap belonged to Maria Jayme. Born in the Philippines, Jayme immigrated to the United States in 1994, where she worked as a nurse in Florida. Jayme was part of a wave of more than 70,000 nurses who moved to the United States between 1965 and 1988. Facing a shortage of nurses, the federal government passed legislation like the Immigration Nursing Relief Act, which helped grant special visas to nurses and eventually allowed them to become permanent residents. Jayme’s story, and her nursing cap, are examples of the increasingly global nature of work in the 20th century. These items just scratch the surface of the incredible history of American women in the workforce. How does your clothing represent your work? What stories does it tell? How is it different than what your grandparents wore to work? Amelia Grabowski is the social media and blog assistant for business and philanthropy history. 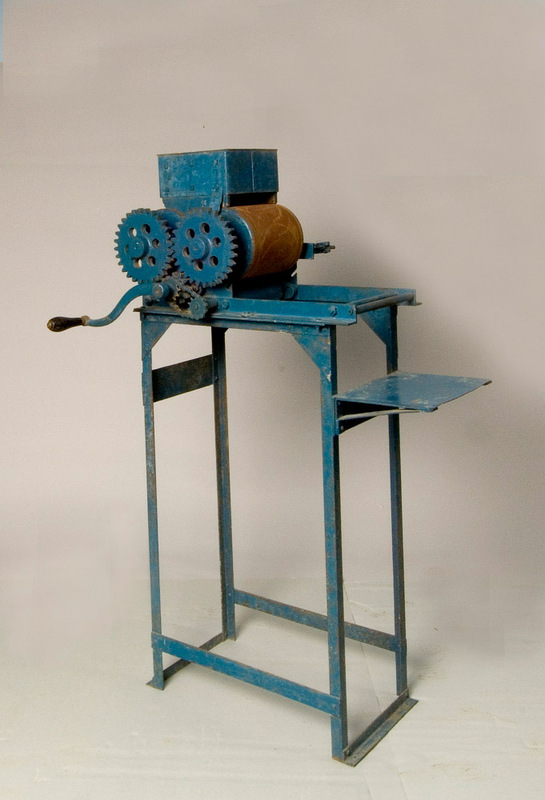 In order to best preserve textiles for generations to come, some objects are only displayed for short periods of time. These specific textiles may not be on display when you visit. The clothing mentioned in this blog post relates to American Enterprise, Uniformed Women in the Great War, FOOD:Transforming the American Table, and Many Voices, One Nation.